What our customers are saying about our Holiday Cottages In Landulph To Rent. "The reception was very welcoming. We felt right at home. We were welcomed by Paula in excellent English and were given a tour and sweets. The lovely pool is very clean and you have a beautiful view of the area. You can also have a la carte lunch next to the pool or in the evening bbq n. The house reaches you through a paved and lit private driveway. Near the spacious house is a very spacious terrace with beautiful views. The supermarket is only one kilometer away. Benevento is a beautiful and cozy city with a special Viking history (with long sometimes blonde Italians) and only 14 km. For a visit to Naples, Ercolano, Pompei and the Amalfi Coast, this accommodation is a great base. The most special thing, however, is the self-esteem with which Paula (landlord) participates several times with us and contemplates helping to get the right medical care (ear infection). Without her, this certainly did not work! Margreeth, Pim, Josien, Joost and Gijs." "The accommodation is beautifully situated and the welcome was very warm and correct. The apartment is spacious and well equipped. It is located in a cozy farm with many animals and a beautiful pool. 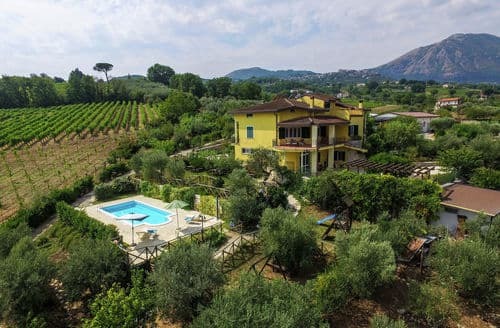 The largest balcony of the apartment has breathtaking views of the surrounding villages and mountains. We were surprised a few times with a bottle of wine, homemade pizza, apple pie ... The daughters of the homeowners speak excellent French and English and are very attentive and helpful. We made trips to Benevento, Vesuvius, Pompeii, Naples, San Agata de Goti, Pietrelcina, Terme de Telese, Caserta, Mercogliano and the Zoo delle Maitiné (recommended). 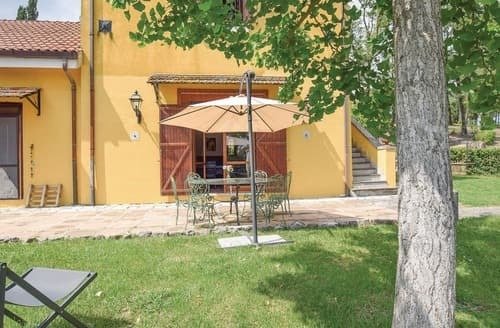 In the farm next to the apartment is agriturismo "La Stella del Taburno" located, where you can eat fantastic at bargain prices, real Italian slow food! The apartment is a must if you are looking for bucolic tranquility in a beautiful and unspoilt environment." "Very new, clean and tidy. Shared pool with only one other family, so often had it to ourselves. Owners tried to deal with most problems straight away. VERY difficult to find first time - owners need to furnish better map/directions. Huge drawback is 4 or 5 dogs that bark ALL NIGHT LONG, necessitating us to keep all doors shut at night - in 30 degree heat! For this reason, and the villa's distance from all major sites, we would not readily return. We also often had no water although this is probably not the owners' fault. Patio is tricky to get to with bowls of food. Kitchen could be better equipped - no oven dishes." "Beautiful house. Nice location.The reception is fine. Get all the tips to explore the environment.Some morning surprised with tomatoes and lettuce from their own garden and fresh figs! Pity that it is a bit neglected.Fixed outdoor barbeque that is no longer usable.There is also another but that is very dirty, the double bed is also in need of replacement which drops on one side all the way through.If a little attention is paid to this is a real paradise!" "Very friendly welcome, very welcoming, attentive and helpful. Beautiful rural environment. Many animals, so keep in mind their sounds. It did not bother us. We received fruit and snacks from our own garden and kitchen. Nice view. Naples, Capua, Caserta and Benevento are nearby for day trips. We had a fantastic week."